When day trading the US stock market you may notice certain tendencies, based on the time of day, which occur more often than not. These tendencies or pattern don't occur every day but may occur often enough for professional day traders to base their trading around them. The simplest pattern is that there is a tendency for the stock market to become less volatile, flatten out, and see less volume in and around the New York lunch hour. Many day traders stop trading about half-an-hour to an hour before this slow down kicks in and don't trade again till well after the lunch hour when volatility and volume pick up again. All times are Eastern Standard Time. Other than the open and close (9:30 AM and 4 PM) times are approximate, only providing a rough gauge of when a tendency typically occurs. 9:30 AM: The stock market opens and there is an initial push in one direction (may take a couple minutes to get going). 9:45 AM: The initial push often sees a significant reversal or pullback. This is often just a short-term shift, and then the original trending direction re-asserts itself. 11:15 to 11:30 AM: The market is heading into the lunch hour, and London is getting ready to close. This is when volatility will typically die out (for a couple hours), but often the daily high or low will be tested around this time. European traders need to close out positions or accumulate a position before they finish for the day. Whether the highs or lows are tested or not, the market tends to "drift" for the next hour or more. 11:45 AM to 1:30 PM: The lunch plus a bit of a time buffer. Usually, this is the quietest time of the day. Best for day traders to avoid it. 1:30 to 2 PM: If the lunch hour was calm, expect a breakout of the range established during lunch hour. Often the market will try to move in the direction it was trading in before the lunch hour doldrums set in. 2 to 2:45 PM: The close is getting closer and many traders are trading with the trend thinking it will continue into the close. That may happen but expect some sharp reversals around this time, because on the flip side, with the close getting closer many traders are quicker to take profits and/or move their trailing stops closer to the current price. 3 and 3:30 PM: These are big "shake out" points, in that it will force many traders out of their positions. If a reversal of the prior trend occurs around this time, the price is likely to move very strongly in the opposite direction as traders are forced out of losing trades with time winding down. Even if the prior trend does sustain itself through these periods, expect some quick and sizable counter-trend moves. As a day trader, it is best to nimble. Don't get tied to one position or one direction. It is going to be very hard to hold a trade for very long between 3 PM and the close. The last hour of trading is the second most volatile hour of the trading day. Many day traders only trade the first hour (or two) and the last hour of the trading day. 3:58 to 4 PM: Market closes at 4 PM; after that liquidity dries up in nearly all stocks and ETFs, except for the very active ones. Close all positions a minute or more before the closing bell, unless you have orders placed to close your position on a closing auction or "cross" (see NYSE and NASDAQ closing auction info). The enlarged versions of figure one and figure two show these tendencies playing out in the S&P 500 index and the S&P 500 SPDR ETF (SPY). These screenshots were taken almost two years apart, yet the tendencies still tend to play out (although not always exactly, as the charts show). Big news events can throw a wrench in these tendencies, resulting in big trends, reversals or movement through the lunch hour (or other time) which would be uncommon without some sort of external catalyst. The times provided are estimates only, and therefore can be incorporated into a trading strategy (if you adequately test if the tendency is reliable) but the tendencies should never be used as a strategy or trade signal on their own. 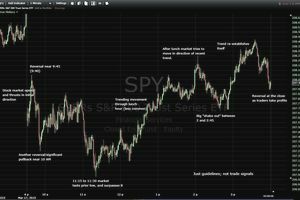 Where Can I Find Free Real-Time Stock Charts for Day Traders?